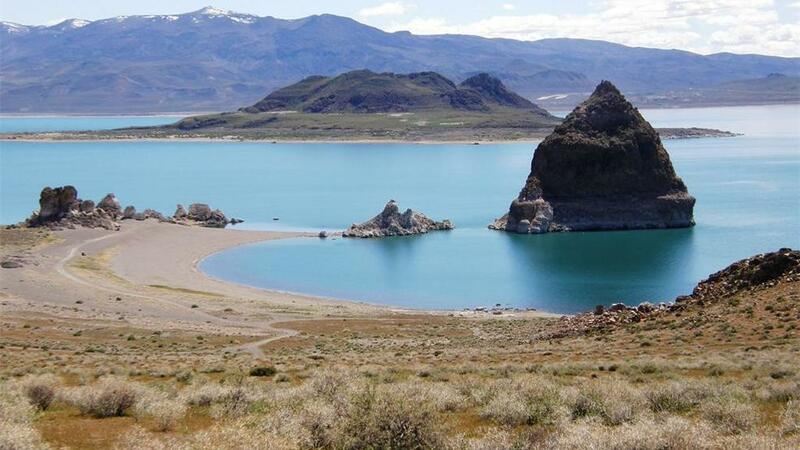 Pyramid Lake is located thirty five miles northeast of Reno, Nevada in a remote desert area. Pyramid Lake is a beautiful desert lake. 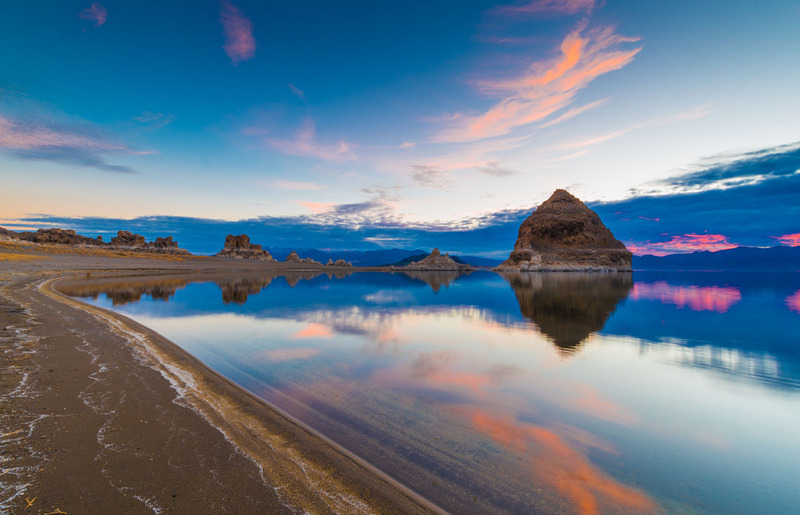 The water in Pyramid Lake comes from the Truckee River, which flows some 121 miles from its source at Lake Tahoe in the Sierra Nevada. 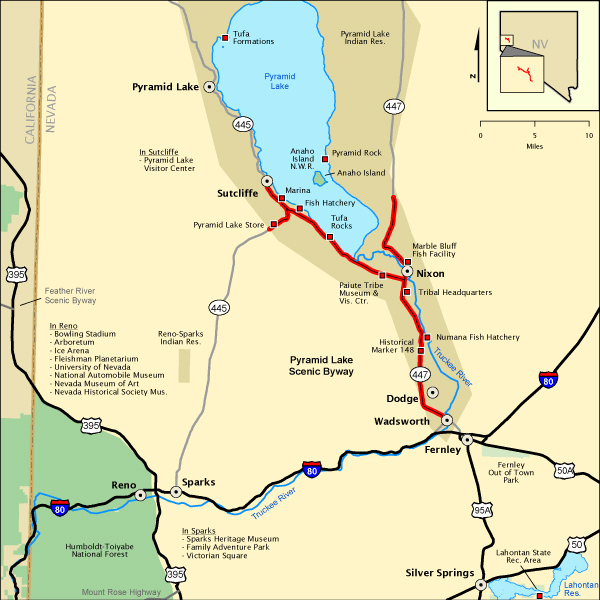 Pyramid Lake is completely within the Pyramid Lake Paiute Tribe Reservation. The Truckee River enters Pyramid Lake at its southern end. 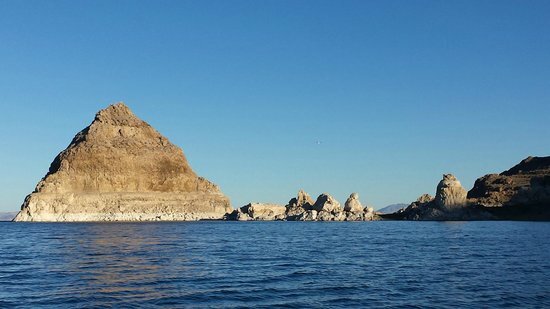 Pyramid Lake has no outlet, with water leaving only by evaporation, or sub-surface seepage. The lake has about 10% of the area of the Great Salt Lake, but it has about 25% more volume. The salinity is approximately 1/6 that of sea water. Although clear Lake Tahoe forms the headwaters that drain to Pyramid Lake, the Truckee River delivers more turbid waters to Pyramid Lake after traversing the steep Sierra terrain and collecting moderately high silt-loaded surface runoff. What locals call the Pyramid Highway (Nevada 445) starts at I80 in Sparks, near Victorian Square. Depending on exactly where you start in Sparks, it's about 30 miles to Pyramid Lake. Most areas designated for camping, fishing, boating, swimming, and other activities are along Pyramid Lake's west shore. For sightseeing, bird watching, and photography, some additional spots around on the east side are accessible via unpaved roads. Rangers / tribal police are sworn peace officers and patrol the reservation. Those using the area without a valid permit will be cited. For more information, call (775) 476-1155. Details of rules and regulations are available online (10 percent discounts for seniors 65 and older, military (active, veterans, reserves).